Heat Indicators Part 2 elaborated on tactile effects. 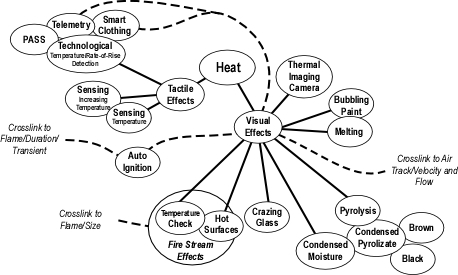 This post will examine visual effects and provide an expanded heat indicators concept map. Remember that as with each of the B-SAHF (building, smoke, air track, heat, and flame) indicators; it is essential that assessment of heat is integrated with other elements of the B-SAHF scheme to gain a clearer sense of fire conditions and likely fire behavior. Air track often provides an early heat indicator. Observation of turbulent smoke pushing from the building at high velocity is a reliable indicator of a tremendous amount of heat energy and high temperatures inside the structure. Note: Photo by Terry Moody, Ranlo NC. Some visual indicators can be observed from the exterior such as bubbling paint, melting or softening roofing material, crazing glass, and condensation of pyrolyzate on windows. High temperature (and in some cases, not so high temperature) can have a more dramatic effect (see Figure 3). 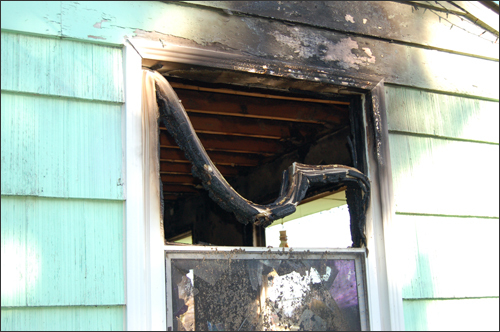 This vinyl frame window failed due to heat resulting from a fully developed fire inside the compartment. A thermal imaging camera (TIC) provides a highly effective means for visualizing temperature differences (see Figure 5). Use of a TIC should begin on the exterior and continue during interior operations. Despite the tremendous advantage provided by use of a TIC, it is essential to be mindful of the limitations of this technology. Thermal images only identify the temperature differences that are in direct line-of-sight. Insulating materials such as compartment linings can prevent the TIC from identifying fire conditions outside the compartment (e.g., floor below, ceiling void). 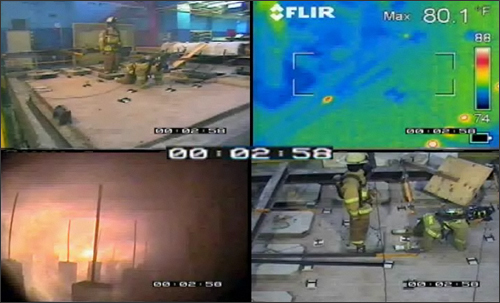 In tests of floor and roof assemblies conducted by the Underwriters Laboratory (UL), thermal imaging cameras were unable to detect a fully developed fire below a typical wood floor (see Figure 6). The floor in Figure 6 consisted of an engineered system of I-joists, sub-floor, finished floor, carpet padding, and carpet. The floor system was being tested over a 14′ x 17′ (4.27 m x 5.18 m) gas fired furnace in accordance with ASTM E119. While the temperature indicated by the TIC is 80.1o F (27o C), the highest temperature measured by thermocouples on the structural members was in excess of 1341o F (727o C). It is essential to integrate thermal image data with direct visual observations to obtain a more complete picture of temperature conditions. 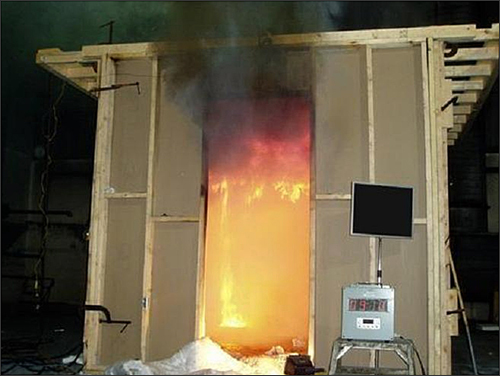 The tests of engineered lumber systems and training program developed by UL provide excellent information on performance of these structural materials under fire conditions. 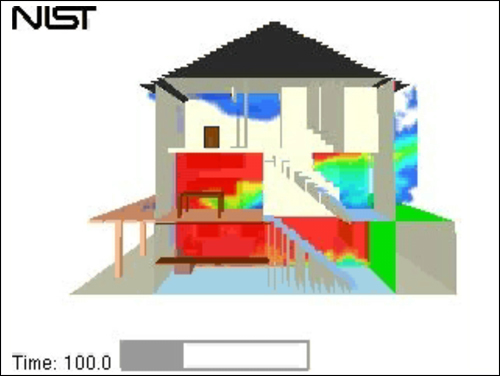 This program as well as on-line training on fire behavior in single family dwellings and fire modeling are available free of charge from UL University. 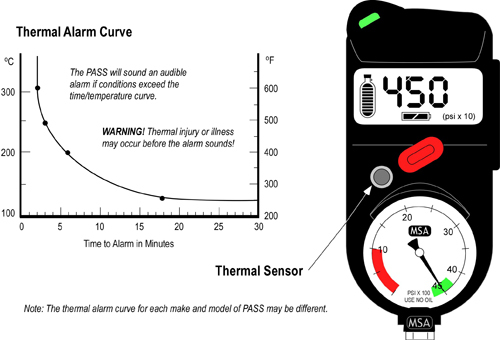 Technological advancements also include temperature sensing integrated into breathing apparatus, personal alert safety systems (PASS), and even protective clothing (see Figure 7) to assist firefighters in recognizing dangerous elevated temperatures and in some cases telemetry to transmit this information to others, outside the hazardous environment. This could be viewed as a visual indicator (based on visual display of the information) or as augmentation of tactile indicators. Hopefully we have been working on this project together and you have been developing or refining the air track segment of your fire behavior indicators concept map. My current map is illustrated in Figure 8. You can also download a printer friendly version of the Heat Indicators Concept Map v5.2.2.1 As always, should you have any suggestions or feedback, please post a comment! The Lake Station (IN) Fire Department was dispatched to a reported structure fire in the vicinity of the American Legion Hall on Central Avenue. Responding companies found a commercial building with fire and smoke showing at the intersection of Central Avenue and Howard Street. While the video clip of this incident does not allow you to walk around the building and observe fire conditions, Google maps street view allows you to view all sides of the building. If you haven’t used street view, have a look at the following Google Street View Tutorial. Perform a “walkaround” by clicking on the following link to view the building involved at this incident: 1691 Central Ave, Lake Station, IN. Note: Radio communication in the video clip identifies the Incident Commander as “Howard Command”. However, for this activity, I have identified Central Avenue as the A Side of the involved building. Click on the arrows to move east on Central Avenue and move and adjust the compass rose to look at Side D. Move back along Central Avenue and then go down Howard Street, again adjusting the compass rose to look at Sides B and C. After your “walk around”, complete the Building Factors segment of the B-SAHF Worksheet. Watch the next three minutes of the video and identify if, and how conditions change from the beginning of the clip until the first line is placed in operation (at approximately 04:00). Watch the next 2 minutes 30 seconds until the firefighters make entry through the door on Side A (at approximately 06:30). What conditions would you expect to find inside this part of the building? Watch the remainder of the video clip. Important: While not related to Reading the Fire, you likely heard the Personal Alert Safety System (PASS) device sounding through much of the incident. While PASS devices can (and often are) accidentally activated, continuous sounding of a PASS indicates a firefighter in distress. While this was not the case in this incident, failure to silence PASS devices that are accidentally activated desensitizes firefighters to this important audible signal. August 1994 saw the loss of two company officers and a firefighter in three separate incidents involving extreme fire behavior. Rapidly changing fire conditions are a threat to firefighters working in career staffed, urban fire departments and volunteer departments serving small communities. 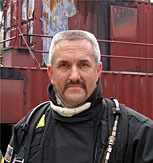 On August 7, Captain Wayne Smith of the New York City Fire Department was critically injured while conducting search and rescue operations on an upper floor of a building when he was trapped by high heat and heavy smoke conditions. Captain Smith was burned over 40 percent of his body and received severe smoke inhalation injuries to his lungs. He died on October 4 from his injuries. Fourteen other firefighters were injured in the blaze. Initial operations were hampered by a faulty fire hydrant across the street from the building. On August 8, Sergeant Craig Drury of the Highview (KY) Fire District was caught in a flashover while making entry into a single story house. Sgt. Drury suffered severe burns to his lungs that eventually caused his death. The fire was started by an arsonist. On August 27, Firefighter Paul MacMurray of the Hudson Falls (NY) Volunteer Fire Department responded as part of an engine company to a fire on the first floor of in a three story hotel. Assigned to search for and rescue occupants on the second floor, MacMurray and another firefighter successfully evacuated several victims while attempts to extinguish the fire were initiated below them. Upon their return to continue the search, conditions quickly changed from a light haze of smoke to black smoke with high heat conditions. MacMurray and his partner became separated in their attempt to locate the stairwell and get out of the building. The other firefighter made several efforts to locate MacMurray, but was forced to retreat due to untenable conditions. Several rescue efforts were made but heavy fire conditions eventually forced the evacuation of all fire personnel to defensive positions as the entire structure burned. MacMurray’s body was recovered the following day. The fire was of incendiary origin. As you develop the heat indicators concept map it is likely that you will uncover potential additions to the Building Factors, Smoke, or Air Track Indicators concept maps. You may also identify interrelationships that you may not have thought of previously. Don’t forget to go back and capture these thoughts by adding them to your other maps or placing them in a staging area for further consideration. Firefighters, like everyone else, have a commonsense understanding of heat and temperature. This is likely where many of our challenges in really understanding thermodynamics begins. The way in which we use the concepts of heat and temperature on a daily basis are likely to be considerably different than they are used in science. Thermodynamics is a branch of physics that describes processes that involve changes in temperature, transformation of energy, and the relationships between heat and work. Fires and firefighting also involves changes in temperature, transformation of energy, heat and work. “Thermodynamics, like much of the rest of science, takes terms with an everyday meaning and sharpens them – some would say, hijacks them – so that they take on an exact an unambiguous meaning” (Atkins, 2007, p. 3). Thermodynamics deals with systems. A thermodynamic system is one that interacts and exchanges energy with the area around it. A system could be as simple as a block of metal or as complex as a compartment fire. Outside the system are its surroundings. The system and its surroundings comprise the universe. For example we might consider a burning fuel package as the system and the compartment as the surroundings. On a larger scale we might consider the building containing the fire as the system and the exterior environment as the surroundings. 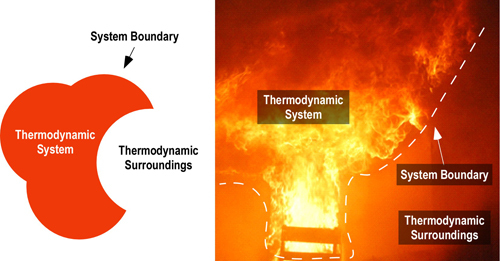 In a compartment fire, energy is exchanged within the thermodynamic system and between the system and its surroundings. Energy is the ability to do mechanical work or transfer thermal energy from one object to another. Energy can only be measured on the basis of its effects. There are basically two kinds of energy, kinetic and potential. Potential energy is that which is stored and may be released at a later time. The chemical energy contained in fuel that can be released during combustion is one example of potential energy. Kinetic energy is associated with motion of an object. Movement of molecules when heated during combustion is a good example of kinetic energy. Temperature is a measure of average kinetic energy. The word flow is often used in discussing heat transfer (e.g., energy flows from materials with higher temperature to those with lower temperature). This helps visualize patterns of movement, but it is important to remember that neither energy nor heat is a fluid. Heat is the process of energy transfer due to temperature differences. It is important to remember that we cannot see energy, temperature, or heat. However, we can see and feel the impact of increases in temperature as a result of heat (energy transfer). Use of the word heat to describe this category of indicators is appropriate as these indicators are all related to transfer of energy within and out of the compartment fires thermodynamic system. When reading the fire it is important not to focus on a single indicator or category of indicators. In the case of heat, there are many interrelationships with air track and flame indicators. In some cases, it is arguable whether an indicator belongs in one category or the other (likely it is not important as long as you recognize the interrelationships). As always in developing a concept map it is important to move from general concepts to those that are more specific. 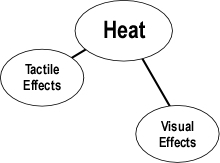 Heat Indicators can be divided into two basic categories, those that you can see (visual effects) and those that you can feel (tactile effects) as illustrated in Figure 2. However, you may choose to approach this somewhat differently. Expanding the map requires identification of additional detail for each of the fundamental concepts. If an idea appears to be obviously related to one of the concepts already on the map, go ahead and add it. If you are unsure of where it might go, but it seems important, list it off to the side in a staging area for possible additions. Download a printer friendly version of Heat Indicators to use as a starting point for this process. Have a look at the following video clip using your partially completed map and notes as a guide to identifying important heat indicators. While this video clip is of conditions inside a compartment, also think about how this fire would present if viewed from the exterior. The next post in this series will discuss visual and tactile heat indicators in greater depth and examine the increasing influence of technology in our perception (and misperception) of developing fire conditions. The first post in this series, Understanding Flashover: Myths & Misconceptions provided a definition of flashover and examined this extreme fire behavior phenomenon in the context of fire development in a compartment. Flashover is the sudden transition to fully developed fire. 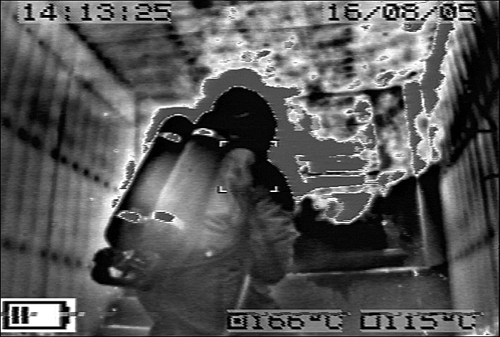 This phenomenon involves a rapid transition to a state of total surface involvement of all combustible material within the compartment….Flashover may occur as the fire develops in a compartment or additional air is provided to a ventilation-controlled fire (that has insufficient fuel in the gas phase and/or temperature to backdraft). In the incipient and early growth stages of a compartment fire, the speed of fire growth is fuel controlled as fire development substantially influenced by the chemical and physical characteristics of the fuel. However, oxygen is required for the fuel to burn and release thermal energy. 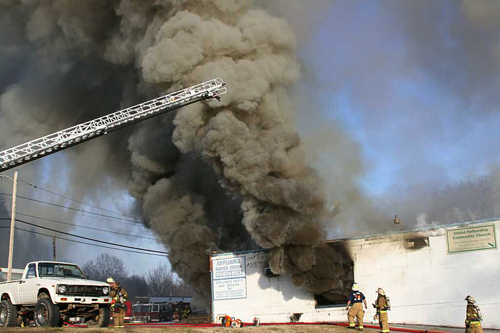 As a compartment fire develops, the available air supply for combustion becomes a more important factor. Increased combustion requires more oxygen and as smoke fills the compartment while the lowering neutral plane at compartment openings restricts the introduction of air into the compartment (see Figure 1). The neutral plane is the level at a compartment opening where the difference in pressure exerted by expansion and buoyancy of hot smoke flowing out of the opening and the inward pressure of cooler, ambient temperature air flowing in through the opening is equal (Karlsson & Quintiere, 2000). 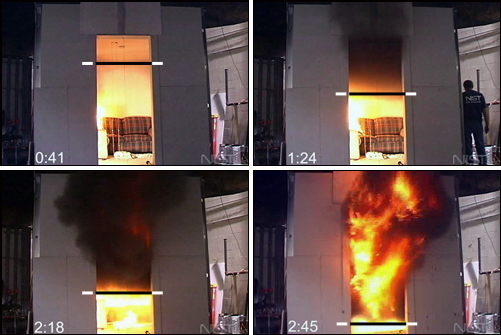 Note: Photos adapted from National Institute of Standards and Technology (NIST) ISO-Room/Living Room Flashover. The distinction between fuel controlled and ventilation controlled is critical to understanding compartment fire behavior. 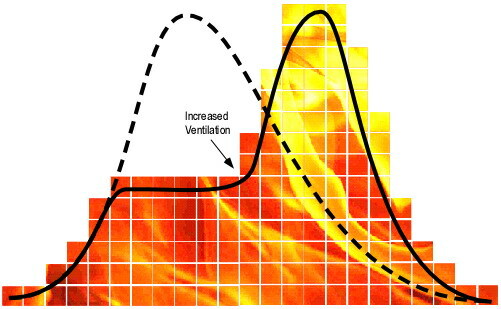 Compartment fires are generally fuel controlled while in the incipient and early growth stage and again as the fire decays and the demand for oxygen is reduced (see Figure 2). While a fire is fuel controlled, the rate of heat release and speed of development is limited by fuel characteristics as air within the compartment and the existing ventilation profile provide sufficient oxygen for fire development. However, as the fire grows the demand for oxygen increases, and at some point (based on the vent profile) will exceed what is available. At this point the fire transitions to ventilation control. As illustrated in Figure 1, a ventilation controlled fire may reach flashover, all that is necessary is that sufficient oxygen be available for the fire to achieve a sufficient heat release rate for flashover to occur. Combustion, as an oxidation reaction requires sufficient oxygen to react with the available fuel. Heat of combustion (energy released) and oxygen required for complete combustion are directly related (Thornton, 1917).The energy released per gram of oxygen consumed during complete combustion of natural and synthetic organic fuels is fairly consistent, averaging 13.1 kJ/g (�0.5%) (Huggett, 1980). Release of chemical potential energy from fuel is dependent on availability of adequate oxygen for the combustion reaction to occur. Interestingly, while the heat of combustion of various types of organic (carbon based) fuel varies widely, the amount of oxygen required for release of a given amount of energy remains remarkably consistent. In the early 1900s, British scientist W.M. Thornton (1917) discovered that the amount of oxygen required per unit of energy released from many common hydrocarbons and hydrocarbon derivatives is fairly constant. In the 1970’s, researchers at the National Bureau of Standards independently discovered the same thing and extended this work to include many other types of organic materials and examined both complete and incomplete combustion (Huggett, 1980; Parker, 1977). Each kilogram of oxygen used in the combustion of common organic materials results in release of 13.1 MJ of energy. This is referred to as Thornton’s Rule. See Fuel and Ventilation for a more detailed discussion of the application of Thornton’s Rule to compartment fires and ventilation. Ventilation controlled compartment fires may reach flashover and fully developed compartment fires are generally ventilation controlled (IAAI, 2009). However, lack of ventilation may prevent a compartment fire from generating sufficient heat release rate to reach flashover. In some cases, ventilation controlled fires to not become fully developed, but decay and self-extinguish due to lack of oxygen. In late 2007 an engine and truck company responded to a report of an odor of smoke in a three-story, wood-frame, apartment building. They discovered a ground floor apartment was smoke logged. They requested a first alarm assignment, forced entry, and initiated fire attack and primary search. 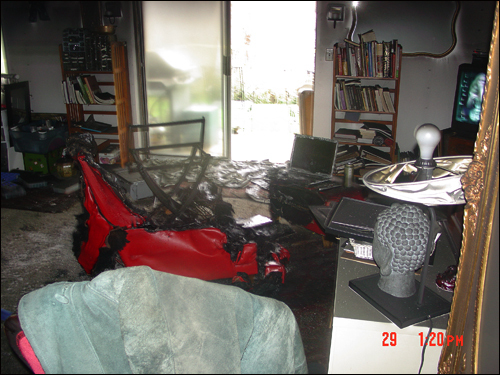 Smoke was cool and to the floor, the fire was confined to an upholstered chair and miscellaneous items in the living room and at the time of entry was simply smoldering (see Figure 3). A rapid search discovered a deceased occupant in a bedroom remote from the fire. 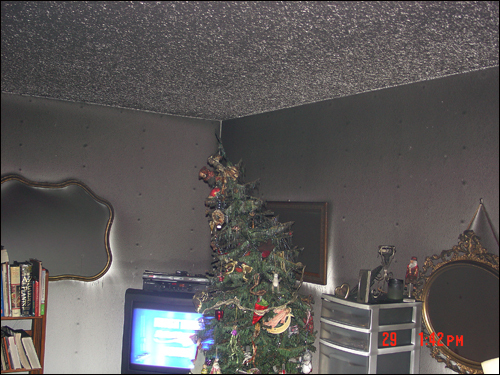 While a fire involving an upholstered chair typically results in sufficient heat release rate for the fire to extend to other nearby fuel packages and ultimately reach flashover, this fire did not as evidenced by the condition of the Christmas tree on the opposite side of the living room from the point of origin (see Figure 4). The Christmas tree, like many other fuel packages in the apartment showed evidence of pyrolysis, but did not ignite. Why didn’t this fire reach flashover? The fire occurred in early winter and the apartment’s energy efficient windows and doors were tightly closed. The developing fire consumed the oxygen available within the apartment and absent significant ventilation, decayed, and the temperature inside the apartment which had been increasing as the fire developed, dropped to a temperature slightly higher than would normally be expected inside an occupied apartment. How might the development of this fire been different if it had been discovered earlier? What if a neighbor had opened a door or window in an effort to rescue the occupant? What if the fire department had opened the door without recognizing that the fire was significantly ventilation controlled? 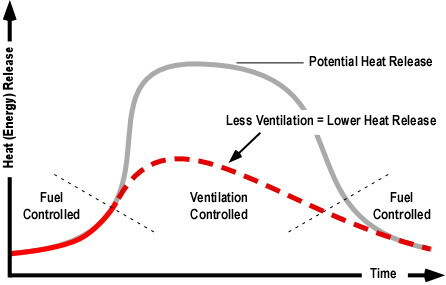 When fire development is limited by the ventilation profile of the compartment, changes in ventilation will directly influence fire behavior. Reducing ventilation (i.e. by closing a door) will reduce the rate of heat release and slow fire development. Increasing ventilation (i.e. by opening a door or window) will increase the rate of heat release and speed fire development. Changes in ventilation profile may be fire caused (failure of glass in a window), occupants (leaving a door open), or tactical action by firefighters; but all will have an influence on fire behavior! 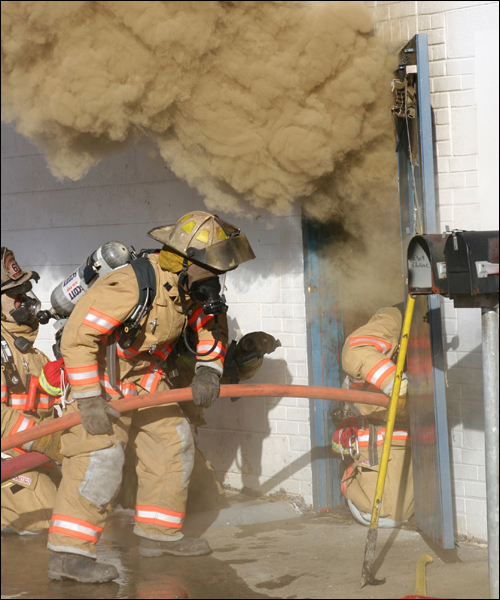 For many years firefighters have been taught that ventilation reduces the potential for flashover. While this is sometimes true, it is only part of the story. Increasing ventilation to a fuel controlled fire will allow hot gases to exit, transferring thermal energy out of the compartment and replacing the hot gases with cooler air (which increases heat release rate). The combined influence of these two factors slows progression towards flashover and increases the heat release rate required to reach flashover. 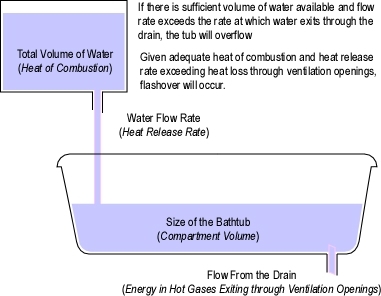 The bathtub analogy presented in Understanding Flashover: Myths and Misconceptions [LINK], does not apply in this case, because when a fire is ventilation controlled, heat release rate is limited by the available oxygen. Under ventilation controlled conditions; increasing air supply by creating opening results in increased heat release rate. 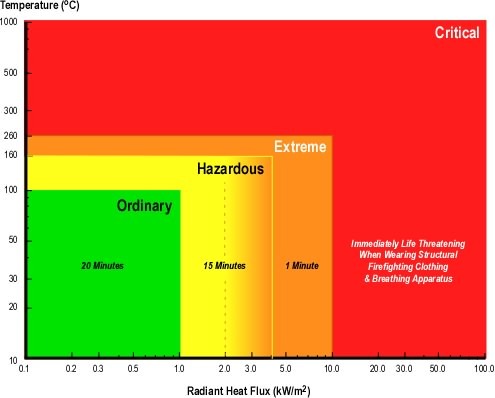 This increased heat release rate may result in flashover (see Figure 5). For more information see Hazards of Ventilation Controlled Fires. With adequate fuel and oxygen, a growth stage compartment fire may flashover and rapidly transition to the fully developed stage. Given adequate fuel, but lacking adequate oxygen (due to limited ventilation), a growth stage compartment fire may begin to decay before becoming fully developed. However, this can quickly change if ventilation is increased, potentially resulting in ventilation induced flashover. Understanding these two paths to flashover is essential, but still does not provide a complete picture of the flashover phenomena. The next post in this series will will use several case studies to examine the influence of air track on flashover in multiple compartments the threat that rapid fire progression presents to firefighters. Karlsson, B. & Quintiere, J. (2000). Enclosure fire dynamics. New York: CRC Press. Thornton, W. (1917). The relation of oxygen to the heat of combustion of organic compounds. The Philosophical Magazine,33(6), 196-203. Parker, W. (1977). An investigation of the Fire Environment in the ASTM E 84 Tunnel Test, NBS Technical Note945. Gaithersburg, MD: U.S. Department of Commerce/National Bureau of Standards. International Association of Arson Investigators (IAAI). (2009). Post flashover fires. On-Line Training Program, Downloaded August 6, 2009 from http://www.cfitrainer.net. My prior post, Reading the Fire: Air Track Indicators began the process of developing or refining an existing concept map of air track indicators. It is important to evaluate air track at openings and on the interior of the structure. As a starting point, I have identified direction, velocity & flow, and wind as basic air track indicator categories (see Figure 1). However, you may choose to approach this somewhat differently. Air track indicators provide critical cues related to stages of fire development, burning regime, and potential for fire spread. However, it is essential that assessment of air track be integrated with other categories of indicators in the B-SAHF scheme to gain a clearer sense of fire conditions and likely fire behavior. Remember that looking at air track alone may be misleading. Discharge of smoke at openings and potential openings (Building Factors) is likely the most obvious indicator of air track while lack of smoke discharge may be a less obvious, but potentially important sign of inward movement of air. Observation and interpretation of smoke and air movement at openings is an essential part of air track assessment, but it must not stop there. Movement of smoke and air on the interior can also provide important information regarding fire behavior. The path taken by the air track will define the direction of fire spread and may present a significant hazard to firefighters operating between inlet and exhaust openings. This necessitates ongoing assessment of air track from both the exterior and interior of the building. Consider the following observations. You arrive at a fire in a commercial building and observe smoke showing from a door on floor 1 (Figure 2). The smoke discharge fills the upper half of the door while it appears that air is moving in the bottom half of the door. What can you infer from this? What would you infer if the smoke discharge completely filled the door? The direction of the air track can also provide valuable cues to fire behavior. When air moves in an opening (inlet) without any smoke discharge, it is likely that smoke is exiting from another opening (exhaust). When this condition is reversed, and smoke comes out with not inward movement of air, it is likely that another opening is serving as an inlet. When the air track is bi-directional and air moves in at the bottom and smoke moves out at the top, this may be the only opening in the compartment or ventilation from other exhaust openings may be inadequate. In any case where smoke is discharging through an opening, the fire is likely moving in that direction. Mixing of smoke and air occurs at the interface between the hot gas layer and cooler air below. This is a critical factor in creating the conditions required for backdraft and many types of fire gas ignitions. Pulsing air track, outward movement of smoke followed by an inward movement of air is indicative of an underventlated fire and potential backdraft conditions (consider other indicators in determining if backdraft conditions are likely to exist). It is critical to remember that these pulsations can vary in duration and that backdraft does not generally occur immediately upon making an opening. The time between making an opening and occurrence of a backdraft is dependent on many factors including distance of the compartment with backdraft conditions from the opening. Air track is an extremely useful indicator, but it must be integrated with a big picture evaluation of fire behavior indicators. Location of inlet and exhaust openings (particularly if they are on different levels or if impacted by wind) is an important Building Factor that directly impacts air track. This is an excellent example of why each of the categories of fire behavior indicators (FBI) must be considered together when reading the fire. 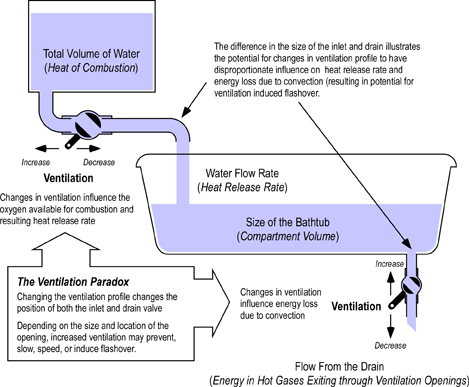 Velocity and flow are two interrelated air track factors. Velocity refers to the speed of smoke and air movement. However, the speed with which smoke is traveling (either out of an opening in the compartment or building or within a compartment) must be considered in relation to the size of an opening or conduit. Flow may be either smooth (laminar) or turbulent. This is dependent to a large extent on velocity. High velocity generally results in turbulent flow through a compartment (such as a hallway) or out an opening (e.g., doorway or window). For a given volume, velocity and turbulence will be higher through smaller openings). High velocity smoke discharge and turbulent flow is generally indicative of high temperature within the compartment (another connection, in this case between air track and heat). Wind can influence smoke movement on the exterior of a building (in some cases masking exterior air track indicators) or it can have a more direct influence on air track. As discussed in a number of earlier posts, wind can have a significant influence on compartment fire behavior. Understanding the potential influence of wind on fire behavior, provides a basis to read and interpret air track indicators. 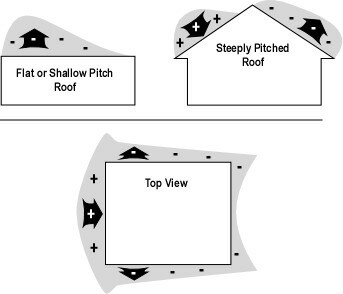 Wind exerts pressure on structural surfaces (see Figure 3), which under fire conditions can have a significant influence on movement of both smoke and air. Note. Adapted from Fire Ventilation (p. 34-35) by Stefan Svensson, 2000, Karlstad,Sweden: R�ddnings Verket. Copyright 2000 by Stefan Svensson & R�ddnings Verket. Wind on an inlet opening can act much the same as a supercharger, dramatically increasing heat release rate, fire intensity, and rate of spread (see Figure 4). Horizontal movement of the hot gas layer and turbulence at the interface between smoke and clear air below indicate air track direction. As discussed in Reading the Fire: Smoke Indicators height of the hot gas layer is a significant indicator of fire conditions. Even more important than the height of the hot gas layer, are changes in height. A sudden rise could indicate that ventilation has occurred (either performed by firefighters or caused by the fire). Gradual lowering of the hot gas layer could indicate worsening conditions and increased potential for flashover. However, inappropriate or excessive application of water can also cause lowering of the hot gas layer. Sudden lowering could indicate worsening conditions caused by flashover in an adjacent compartment. While not commonly known as a backdraft indicator, raising and lowing of the hot gas layer is similar to a pulsing air track observed at an opening (however in this case the compartment is not fully smoke logged, so the expanding and contracting gases cause the bottom of the hot gas layer to move up and down). Height and more importantly vertical movement of the hot gas layer may be considered as Smoke or Air Track Indicators (a good argument can be made in either case). For now, I have chosen to position these two types of indicator under Smoke, but with linkage to Air Track, but I am considering moving them to Air Track (while maintaining linkage to Smoke Indicators). Hopefully we have been working on this project together and you have been developing or refining the air track segment of your fire behavior indicators concept map. My current map is illustrated in Figure 5. You can also download a printer friendly version of the Air Track Indicators Concept Map v5.2.2.1 (including notes made during development). 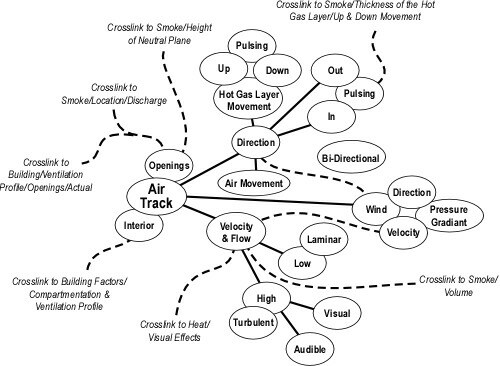 As indicated by the significant number of notes in the Staging Area of the printer friendly version, a bit more work remains to be done before integrating the Smoke and Air Track indicators in the complete version of the Fire Behavior Indicators Concept Map. Should you have any suggestions or feedback, please post a comment! Svensson, S. (2000). Fire ventilation. Karlstad, Sweden: R�ddnings Verket.